Most of my life, I have had a less-than-great relationship with salmon. Growing up, I only remember it coming out of a can, like tuna. Mother used it to make salmon-potato patties, similar to post #3 which uses flaked tuna. While I did not mind the salmon, it was not doing back-flips over the flavor, either. I love the look of fresh salmon...it is such huge fish and the thick, meaty portions are a welcome relief from other small, bony fish. The taste, however, always reminded me of those salmon patties...I don't know why I thought the baked salmon would taste different or better...but, it still had that 'canned salmon' flavor. My husband, on the other hand, loves salmon. In deference to this desire, I have fixed salmon and made myself eat it. It wasn't until I discovered today's recipe that I was finally able to enjoy this lovely fish. 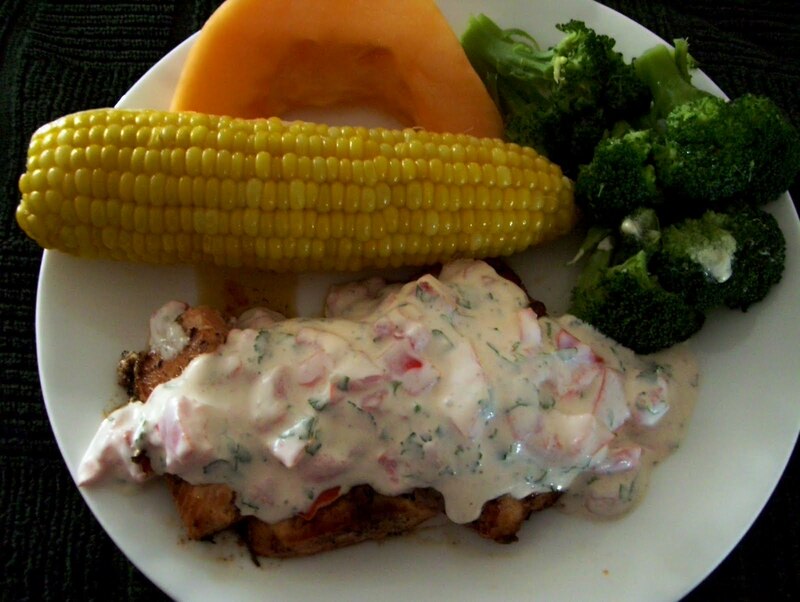 The salmon may be pan fried or grilled and I double the sauce recipe if it is to serve 4. In a medium bowl combine first 3 ingredients. Transfer ½ C to a small bowl and stir in tomato; set aside. Brush fish steaks with remaining mayo mixture. Spray large skillet with cooking spray. Heat over med-high heat. Add fish. Cook, turning once, 8 minutes or until fish is firm but moist. Serve with cilantro-lime sauce. Makes 4 servings. *(I have made this dish with the addition of a blakened seasoning sprinkled on the first side of the fish after it was braised...the taste was wonderful). Grilling directions: Prepare sauce and fish as directed. Grill fish, turning once about 8 min. or until firm but moist. that looks so delicious, Diane! Thanks for sharing!